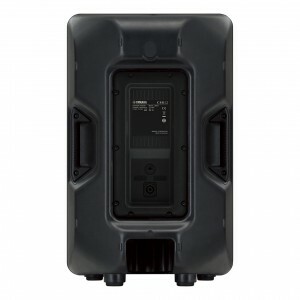 The Yamaha CBR series of loudspeakers are passive versions of Yamaha’s powered DBR series. It uses the same cabinets and (presumably) the same drivers as the DBR, minus the built-in mixer and power amp, and (being passive) include a passive internal crossover network. The DBR12 generally gets very good reviews from owners, so my expectations for the passive CBR12 were high when I purchased 4 of them to use primarily for monitor wedges. I wasn’t disappointed. First off, the street price of $325 for the CBR12 puts this model in a bit of a weird class when it comes to live sound speakers. These are passive speakers, but there are several comparable active/powered speakers with similar specs that are pretty close in price, or cost even less than the CBR12: the Alto TS212A, Behringer B212D, Peavey PVXp 12, Electro Voice ZLX-12P, and EV ELX-112P. So unless someone is set on staying with passive speakers, they could just as easily buy powered speakers for about the same money, although some might argue they could be sacrificing some quality and reliability in the process. 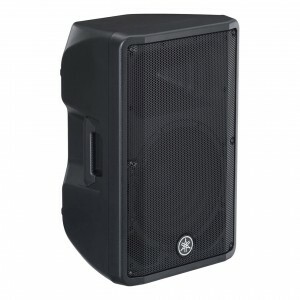 There are also many passive speakers out there with similar specs that also sell for around the same price or less than the CBR12: the Behringer B212XL, EV ZLX-12, EV ELX-112, Peavey PVx 12, or Yamaha’s own Club Series CM12V and SM12V. But with those models, you may again be giving up some quality, SPL’s, and/or weight. I won’t get into the active vs. passive speaker debate at the moment, but in my case, I already had a decent 4-channel power amp (a Behringer NU4-6000) for my monitors and didn’t like the idea of having to run AC power lines to each of them, so I chose to stay passive. As an aside, I wonder if the increasing popularity of active speakers in general is the reason it is difficult to find any thorough reviews of the CBR series: maybe there simply aren’t that many users out there who have tried them relative to their active DBR counterparts, for which there is an abundance of reviews. In any case, the lack of many good reviews being out there in part why I wrote this review, so let’s dig in. The CBR12 cabinets look great and seem well-built. The full-face grille gives them a sleek appearance which would be at home for even high-profile formal or corporate gigs. The cabinet finish is also quite nice. Some reviewers of the DBR series say they like the cabinet finish even better, and it seems a bit tougher and less prone to scratches than Yamaha’s more expensive DXR series cabinets. Weighing in at only 31 lbs, they’re very light, and the side handles (there’s no top handle on this model) make carrying one in each hand very easy and comfortable. The connection panel on the rear of the speaker includes one Speakon & one 1/4″ TS jack, so if you need to daisy-chain multiple cabs, you’ll have to use a combination of 1/4″ and Speakon plugs. Four thick rubber feet are attached to the bottom of each cabinet for placing the speaker on the floor, table, or on top of another speaker. Speaking of stacking speakers, I wouldn’t recommend stacking two CBR12’s, since the top of the cabinet has a slight angle, which could make the top speaker sit crooked and possibly slide off when the speakers are vibrating with moderate to heavy use. So if you are going to stack a CBR12 on top of another cabinet, that other cabinet had better not be another CBR12, unless you somehow modify or secure the top cabinet (which is probably a good idea when stacking ANY speakers). For stand mounting, or pole mounting above a subwoofer, a standard 1 & 3/8″ pole insert is molded into the bottom of the cabinet. There are also 3 threaded fly points that allow them to be rigged or flown from a wall or ceiling for permanent installs. One of these fly points is in the back of the cabinet for adjusting the downward angle/tilt. This rear point is covered by an adhesive-backed plastic cover, which you’ll have to peel off if you need to use it. The other two fly points are in the bottom, meaning the speaker will be upside down from its normal orientation if you’re flying it from a ceiling, or using one of Yamaha’s optional wall (BWS251-300 or BWS251-400), ceiling (BCS251), or baton (BBS251) brackets. I don’t suppose this would have any adverse effect on the sound of the speaker, but it seemed a little strange to me at first. I suspect this decision was made because the bottom of the cabinet is already thicker and stronger than the top, since it includes the built-in pole socket. This simple cost-cutting measure no doubt allowed them to use less material on the top of the cabinet. 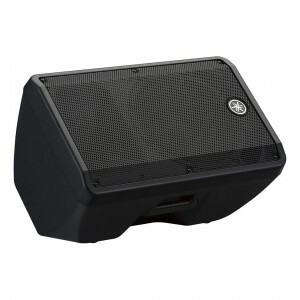 Like many comparable speakers, the CBR12 can be used as either a main or monitor. The angle on the back of the cabinet is the same on both sides, so if a single performer is using 2 CBR12’s for monitors, you can “mirror” them with both horns to the outside, giving a better stereo image (if you’re running a stereo monitor mix). The angle also requires standing at a slightly greater distance than some other monitors that I’ve used in the past, which could cause issues on smaller, cramped stages. You could potentially adjust the angle by placing an object (book, 2×4, etc.) under the cabinet, but be careful not to go too far, or you could risk putting stress on the speaker cable connectors in the rear. If this creates too much of an issue, you could always use a right-angle Speakon or 1/4″ plug. There are also no rubber feet for monitor use–just a couple of nubs/bumps that are molded into the cabinet. I would have preferred some rubber feet, which I suspect would do a better job of protecting the cabinet and de-coupling it from the floor, but the nubs are fairly common to see on molded cabinets these days. For some listening tests, I compared the CBR12 to a couple of different speakers: an older, first-generation Behringer Eurolive F1520, and an active RCF HD12A. The CBR12 easily bested the Behringer. The CBR12’s horn was smoother and less harsh on the higher frequencies, and it was also less prone to feedback when pushed to a higher volume. The CBR12 also had better bass response on program material, even though the F1520 has a 15″ woofer. In fact, one forum poster called the CBR12 “…club series with bass response”. The CBR12 also generally had a more pleasant, less fatiguing sound to my ears when compared to the Behringer. When compared to the active, more expensive RCF HD12A, things got more interesting. The HD12A is almost universally well-liked among those who own it, exhibiting a very hi-fi sound for a live sound speaker. It also has very good bass response for a 12″ speaker, and it sells for more than twice the price of the CBR12. In spite of all of that, I felt like the CBR12 gave the HD12A a run for its money, but the HD12A ultimately came out on top when I compared both my speaking/singing voice, and when playing program material from my iPod. The HD12A also went louder than the CBR12, or at least did so more comfortably. The sound quality of the CBR12 seemed to begin to suffer a bit when pushed to the extreme, but this was only when I pushed it much harder than I normally would in everyday use. And even then, it still sounded reasonaly good. Basically, there weren’t too many surprises with the CBR12, which in this case was a good thing. The CBR12 won out over a cheaper speaker with a lesser pedigree (the Behringer F1520), and came out not far below an active speaker that gets very good reviews and sells for more than twice its price (the RCF HD12A). All in all, I think the CBR12’s will do a fine job as monitor wedges or mains for most any small to medium-sized live band, speaking, or DJ gig. 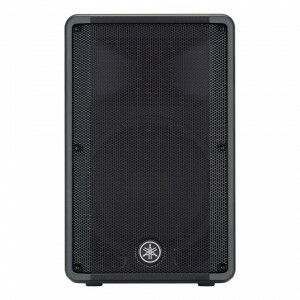 You could also pair them with some subwoofers and use them as mains for even larger gigs, when needed. The pros definitely outweigh the cons here, and any “cons” are quirks rather than show-stoppers. If you’re in the market for a lightweight passive speaker that looks good, sounds good, and can hold its own against the competition as both a main and a monitor, look no further than the Yamaha CBR12.